» Is Bankruptcy More Likely After Tax Season? 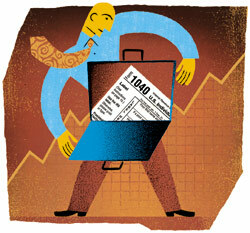 Is Bankruptcy More Likely After Tax Season? It appears that many consumers rely heavily on using their tax refunds to catch up with overdue credit card bills and other financial responsibilities. But the tax refund season only stretches from March through June. So there isa likely relationship with curing credit card defaults in the spring when consumers receive their tax refunds. Several large banks who are facing difficulty in collecting overdue credit card accounts recently blamed the wane of tax refunds for their difficulties, but also pointed to the increase of unemployment. Consequently, there should be a rise in consumer bankruptcy filings in the summer and fall by consumers who need to eliminate their credit card debts. Consumers should be aware that in the state of New York, they can protect and exempt up to $2,500 per person of liquid assets in a bankruptcy proceeding. This includes entitlement to tax refunds, money in the bank and cash in the pocket. A husband and wife can thus protect a total of $5,000 of liquid assets in a bankruptcy case. Thus, for those consumers who have not yet received their tax refunds, they should think twice about using a tax refund to catch up with credit card debt if bankruptcy is a distinct possibility.